Emmerson Dambudzo Mnangagwa (IPA: [m̩.na.ˈᵑɡa.ɡwa], US: ( listen); born 15 September 1942) is a Zimbabwean revolutionary and politician who serves as the third and current President of Zimbabwe since 24 November 2017. A member of ZANU–PF and a longtime ally of former President Robert Mugabe, he held a series of Cabinet portfolios and was Vice-President of Zimbabwe under Mugabe until November 2017, when he was dismissed before coming to power in a coup d'état. He was officially inaugurated as the third President of Zimbabwe on 26 August 2018 after narrowly winning the 2018 Zimbabwean general election. Mnangagwa was born in 1942 in Shabani, Southern Rhodesia, to a large Shona family. His parents were farmers, and in the 1950s he had to move with his family to Northern Rhodesia because of his father's political activism. There, he became active in anti-colonial politics, and in 1963, he joined the newly-formed Zimbabwe African National Liberation Army, the militant wing of the Zimbabwe African National Union (ZANU), and returned to Rhodesia in 1964. Leading a group called the "Crocodile Gang", he attacked white-owned farms in the Eastern Highlands. In 1965, he bombed a train near Fort Victoria (now Masvingo) and was imprisoned for ten years, after which he was released and deported back to Northern Rhodesia, by then independent as Zambia. He then studied law at the University of Zambia and later at the University of London, and practiced as an attorney. He soon left legal private practice and went to Portuguese Mozambique to rejoin ZANU. There he was assigned to be Robert Mugabe's assistant and bodyguard, accompanying him to the Lancaster House Agreement, which resulted in the recognised independence of Zimbabwe in 1980. After independence, Mnangagwa held a series of senior Cabinet positions under Mugabe. From 1980 to 1988, he was the country's first Minister of State Security, and oversaw the Central Intelligence Organisation. His role in the Gukurahundi massacres, in which thousands of Ndebele civilians were killed and which occurred during his tenure, is controversial. Mnangagwa was Minister of Justice, Legal and Parliamentary Affairs from 1989 to 2000 and then served as Speaker of the Parliament from 2000 to 2005, when he was demoted to Minister of Rural Housing for openly jockeying to succeed the aging Mugabe. He returned to favour during the 2008 general election, in which he ran Mugabe's campaign, orchestrating political violence against the opposition Movement for Democratic Change – Tsvangirai. Mnangagwa served as Minister of Defence from 2009 until 2013, when he became Minister of Justice again. He was also appointed First Vice-President in 2014 and was widely considered to be a leading candidate to succeed Mugabe. Mnangagwa's ascendancy was opposed by the President's wife, Grace Mugabe, and her Generation 40 faction. He was dismissed from his positions by Mugabe in November 2017, and fled to South Africa. Soon after, General Constantino Chiwenga, backed by elements of the Zimbabwe Defence Forces and members of Mnangagwa's Lacoste political faction, launched a coup. After losing the support of ZANU–PF, Mugabe resigned, and Mnangagwa returned to Zimbabwe to assume the presidency. He secured his first full term as President in the July 2018 election with 50.8% of the vote. Mnangagwa is nicknamed "Garwe" or "Ngwena", which means "the crocodile" in the Shona language, initially because that was the name of the guerrilla group he founded, but later because of his political shrewdness. The faction within ZANU–PF that supports him is called Lacoste after the French clothing company whose logo is a crocodile. Dambudzo Mnangagwa was born in Shabani (today Zvishavane), a mining town in central Southern Rhodesia, on 15 September 1942. Though some sources give his birth year as 1946, Mnangagwa himself says he was born in 1942. His parents, Mafidhi and Mhurai Mnangagwa, were politically active farmers. He came from a large family – his grandfather had six wives and 32 sons, including his father (daughters were not counted), and Mnanganga himself is the third of ten siblings. His father had two wives, having inherited his wife Mhurai's sister after the death of her husband. Mnangagwa then had eight additional half-siblings who were also his cousins. The Mnangagwa family were members of the Karanga people, the largest subgroup of Zimbabwe's majority Shona ethnic group. As a young child, Mnangagwa herded cattle and was also permitted to visit the local chief's court, where he would go and watch cases being heard in a traditional tribal court setting. His paternal grandfather Mubengo Kushanduka had a large influence on him during his formative years. Kushanduka had served at the court of the Ndebele king Lobengula, and had fought in the Second Matabele War in the 1890s, and Mnangagwa enjoyed listening to him tell stories. By the late 1940s, Mnangagwa's father Mafidhi had become the acting chief of the village. In 1952, a white Land Development Officer arrived and confiscated some cattle from the villagers, including from an elderly woman who was left with just three. In response, Mafidhi's advisors removed a wheel from the officer's Land Rover, and Mafidhi was arrested. The District Commissioner said he did not want to fight or imprison him, and told him to go to Northern Rhodesia. He went, and settled in Mumbwa with a relative. Several years later, he sent for the rest of his family, including the preteen Mnangagwa, to join him in Northern Rhodesia. They arrived by train in 1955 and settled in Mumbwa, where more extended relatives would come to live over the years. There, Mnangagwa first met Robert Mugabe when Mugabe stayed with the Mnangagwa family for a time while working at a teachers' college in Lusaka. Mugabe inspired Mnangagwa to become involved in anti-colonial politics. Mnangagwa, who had already begun his primary education at Lundi Primary School in Shabani, resumed his education at Myooye School in Mumbwa. Most of his classmates at Myooye had three names, while Mnangagwa only had one, Dambudzo. After finding a book in the school library by the American philosopher and poet Ralph Waldo Emerson, he decided to adopt the name "Emmerson" before his given name. After a short period at Myooye, Mnangagwa completed standards 4, 5, and 6 at Mumbwa Boarding School. From 1958 to 1959, he attended Kafue Trade School in Kafue, where he took a building course. Although his course at Kafue was supposed to last three years, in 1959 Mnangagwa decided to leave early and attend Hodgson Technical College, one of the country's leading educational institutions. Because the college only accepted applicants with O Levels, which he lacked, he took the entrance exam, and received a high score. At Hodgson, he enrolled in a four-year City and Guilds Industrial Building program. He became involved in student anti-colonial politics, joining and becoming an elected officer of the college's United National Independence Party (UNIP) branch. His activism sometimes turned violent, and in 1960 he was found guilty of setting one of the college's buildings on fire and was expelled. After his expulsion, he and three other men started a construction company, which lasted for three months. He was tasked by UNIP leaders to organise and expand the party's presence in Bancroft, a town in the Copperbelt region, until the end of 1961. After that, he returned to Lusaka, where he served as Secretary of the UNIP Youth League while also working in for a private company. In 1962, Mnangagwa was recruited in Northern Rhodesia by Willie Musarurwa to join the Zimbabwe African People's Union (ZAPU), a newly-formed pro-independence party in Southern Rhodesia. He joined as a guerrilla fighter for ZAPU's armed wing, the Zimbabwe People's Revolutionary Army (ZIPRA), and was sent to Tanganyika (today Tanzania) for training. He first stayed in Mbeya, and then at the new training camp in Iringa, where he met leading black nationalists like James Chikerema and Clement Muchachi. While there, he criticized the decisions of ZAPU's leader, Joshua Nkomo, an offence for which he was sentenced to death by a ZIPRA tribunal. However, two other ZAPU members of the same Karanga background, Simon Muzenda and Leopold Takawira, the party's external affairs secretary, intervened to save his life. In April 1963, Mnangagwa and twelve other ZAPU members were sent via Dar es Salaam to Egypt for training at the Egyptian Military Academy in Cairo's Heliopolis suburb. In August 1963, ten of the thirteen Southern Rhodesians in Egypt, Mnangagwa included, decided to join the Zimbabwe African National Union (ZANU), which had been formed earlier that month as a breakaway group from ZAPU. The ten stopped training for ZAPU and were subsequently detained by Egyptian authorities. During their detention, they contacted ZANU leader Robert Mugabe, who was in Tanganyika at the time, and communicated to him that they intended to join ZANU and had been detained. Mugabe redirected Trynos Makombe, who was returning from China, to go to Egypt instead and resolve the issue. Makombe secured their release and gave them flight tickets to Dar es Salaam. After arriving in Tanganyika in late August 1963, six of the eleven returned to Southern Rhodesia, while the remaining five, including Mnangagwa, were sent to briefly stay at a training camp in Bagamoyo run by FRELIMO, the group seeking to liberate Mozambique from Portugal's rule. Mnangagwa soon left Tanganyika to train for ZANU's militant wing, the Zimbabwe African National Liberation Army (ZANLA). Part of the first group of ZANLA fighters sent overseas for training, he and four others were sent to Beijing, China, where he spent the first two months studying at Peking University's School of Marxism, which was run by the Communist Party of China. He subsequently spent three months in combat training in Nanjing. He then studied at a school for military engineering, before returning to Tanzania in May 1964. There, he briefly stayed at ZANLA's Itumbi Reefs training camp near Chunya in the southwestern part of the country. Upon returning to Tanzania, Mnangagwa cofounded the "Crocodile Gang", a ZANLA guerrilla unit led by William Ndangana that included the other men he had trained with in China: John Chigaba, Robert Garachani, Lloyd Gundu, Felix Santana, and Phebion Shonhiwa. They were supposed to be provided with weapons, however none were available. They rushed to attend the ZANU Congress in the Mkoba section of Gwelo in central Southern Rhodesia, arriving the day before it commenced. At the Congress, Ndabaningi Sithole was elected President, Leopold Takawira as Vice-President, Herbert Chitepo was to be National Chairman, and Robert Mugabe was elected Secretary General. Shortly after the Congress, three of Mnangagwa's comrades-in-arms were captured and arrested for smuggling guns into the country. He sent Lawrence Svosve to Lusaka to retrieve some messages, but he was never seen again. Despite these losses, the Crocodile Gang remained active and were joined by Matthew Malowa, a ZANU member who had trained in Egypt. Besides smuggling weapons into Southern Rhodesia, ZANLA leaders tasked the Crocodile Gang with recruiting new members from the urban centres of Salisbury (now Harare), Fort Victoria (now Masvingo), Mberengwa, and Macheke, and smuggling them through the border at Mutoko into Tanzania for training. The Crocodile Gang traveled back and forth between Salisbury and Mutoko, completely on foot. Soon, ZANU leaders at Sikombela sent the group a message urging them to take some extreme actions in order to raise publicity. They hoped that the exposure would bring ZANU's efforts to the attention of Organisation of African Unity's Liberation Committee, which was meeting in Dar es Salaam at the time. The Crocodile Gang, which was at this time composed of William Ndangana, Matthew Malowa, Victor Mlambo, James Dhlamini, Master Tresha, and Mnangagwa, met to make plans at Ndabaningi Sithole's house in Salisbury's Highfield township. On 4 July 1964, the Crocodile Gang ambushed and murdered Pieter Johan Andries Oberholzer, a white foreman and police reservist, in Chimanimani, near Southern Rhodesia's eastern border. James Dhlamini and Victor Mlambo were caught and hanged, while the others evaded capture. The event marked the first instance of violence in what would become the Rhodesian Bush War, and caused the government to crack down on both ZANU and ZAPU. In August 1964, the administration of Prime Minister Ian Smith imprisoned Ndabaningi Sithole, Leopold Takawira, Edgar Tekere, Enos Nkala, and Maurice Nyagumbo. ZANLA was left with Josiah Tongogara and Herbert Chitepo as its leaders. Before the Oberholzer murder, the Gang had already bombed the Nyanyadzi police station and attempted other ambushes after arriving in Southern Rhodesia via bus from Kitwe, Northern Rhodesia. They continued their campaign of violence after the murder, setting up roadblocks to terrorize whites and attacking white-owned farms in the country's Eastern Highlands. They were known for their use of knives and for leaving green handwritten anti-government pamphlets at the scenes of their crimes. In late 1964, Mnangagwa blew up a train near Fort Victoria (now Masvingo), and was arrested by police inspectors in January 1965 at Michael Mawema's house in Highfield. Mawema may have betrayed him to police. He was given over to the Rhodesia Special Branch, who tortured him by hanging him upside down and beating him, an ordeal that allegedly caused him to lose hearing in his left ear. He was convicted under Section 37 (1) (b) of the Law and Order Maintenance Act and sentenced to death. However, his lawyers were able to successfully argue that he was younger than twenty-one, the minimum age for execution. Depending on which birth year is accepted for Mnangagwa, this claim might have been a lie. Other sources state that a priest intervened on his behalf, or that he was spared because he was Zambian, not because of his age. Whatever the reason, Mnangagwa was spared execution and sentenced to ten years in prison. Mnangagwa served the first year of his sentence in Salisbury Central Prison, followed by the Grey Street Prison in Bulawayo, and finally, Khami Maximum Security Prison in Bulawayo, where he entered on 13 August 1966 and spent the last six years and eight months of his sentence. At Khami, Mnangagwa was given the number 841/66 and classified as "D" class, reserved for those considered most dangerous, and was held in a separate block of cells with other political prisoners, whom the government kept away from other prisoners out of fear that they would influence them ideologically. His cell, Cell 42, was in "B" Hall, which also housed future Vice-President Kembo Mohadi and revolutionary and journalist Willie Musarurwa. Mnangagwa's cell at Khami was austere, with double-thick walls and only a toilet bucket and Bible allowed inside. At first, while still on death row, he was allowed to leave his cell for only 15 minutes per day, during which he was expected to exercise, empty his toilet bucket, and have a shower in the communal washroom. The Rhodesia Prison Service had different facilities and rules for white and black prisoners, who were subjected to significantly inferior conditions. Black inmates were given just two sets of clothes, and were fed plain sadza and vegetables for every meal. For his first four years at Khami, Mnangagwa was assigned to hard labour. Then, the Red Cross visited and complained to the government about the poor conditions of political prisoners. The government eased conditions somewhat, and instead of hard labour, Mnangagwa volunteered as a tailor, since he already knew how to use a sewing machine. After two years mending other inmates' tattered clothes, he was told to join the other prisoners in doing hard labour, crushing rocks in a large pit in the prison yard. He was discharged from Khami on 6 January 1972 and transferred back to Salisbury Central Prison, where he was detained alongside other revolutionaries including Robert Mugabe, Enos Nkala, Maurice Nyagumbo, Edgar Tekere and Didymus Mutasa. There, he befriended Mugabe and attended his prison classes, after which he passed his O Levels and A Levels. Together, they studied law via correspondence. He initially wanted to pursue a Bachelor of Science in Economics, but instead decided to study law. In 1972, he took his final examinations for a Bachelor of Laws through the University of London International Programmes. Mnangagwa and his lawyers discovered a loophole in his law that would allow him to be deported if he claimed to be Zambian. Even after his ten-year sentence expired, he remained in prison for several months while his papers were being processed. In 1975, after more than ten years in prison, including three years in solitary confinement, he was released and deported back to Zambia, where his parents were still living. He was brought to the Livingstone border post and handed over to Zambian police. A ZANLA representative met him at the Victoria Falls Bridge and took him back to Lusaka. Once back in Lusaka, Mnangagwa continued his education at the University of Zambia, where he was active in the student board for politics, graduating with a postgraduate law degree. He then completed his articling with a Lusaka-based law firm led by Enoch Dumbutshena, who would later become Zimbabwe's first black judge. He was admitted to the Zambian bar in 1976. At the same time, Mnangagwa was also serving at the Secretary for ZANU's Zambia Division, based in Lusaka. After a couple years working for a private law firm, he left legal practice and went to Mozambique where the Mozambican War of Independence against Portuguese colonial rule was ongoing. He visited Maputo at the request of Josiah Tongogara, and on the basis of the friendship that he had developed with Mugabe while in prison, he became a security chief for ZANU. While there, he met Robert Mugabe again, and became his assistant and bodyguard. At the 1977 ZANU Congress in Chimoio, he was elected Special Assistant to President Mugabe and a member of ZANU's National Executive. In his capacity as Special Assistant, Mnangagwa headed both the civil and military divisions of ZANU. His deputy was Vitalis Zvinavashe, who was head of security for the Military High Command but still ranked below Mnangagwa in the Central Committee's Department of Security. Mnangagwa accompanied Mugabe to the London negotiations that led to the signing of the Lancaster House Agreement, which ended the country’s unilateral declaration of independence and created the newly recognised Republic of Zimbabwe. In January 1980, Mnangagwa led the first group of civilian leaders, including Didymus Mutasa and Edson Zvobgo, as they made their way from Maputo, Mozambique to what became Zimbabwe in April that year. On 12 March 1980, a little more than a month before Zimbabwe's independence, incoming Prime Minister Robert Mugabe named his first cabinet. Mnangagwa was named Minister of State for National Security in the President's Office. Among other roles, he oversaw the Central Intelligence Organisation, the national intelligence agency. In that position, he cultivated strong relationships with Zimbabwe's security establishment. After the head of the Zimbabwean military, Rhodesian holdover General Peter Walls, was dismissed by Mugabe on 15 September 1980, Mnangagwa also took over as Chairman of the Joint Operations Command. In that role, he oversaw the integration of ZANLA and ZIPRA fighters with the preexisting units of the Rhodesian Army. During this period, he also served as ZANU's secretary for national security. In the 1985 parliamentary election, Mnangagwa ran as the ZANU candidate for the Kwekwe East constituency. He won with 86% of the vote, defeating ZAPU's Elias Hananda and the United African National Council's Kenneth Kumbirayi Kaparepare, who respectively received 11% and 3% of the vote. While Mnangagwa was Minister of State for National Security, the 5th Brigade of the Zimbabwe National Army killed thousands of Ndebele civilians in the Matabeleland region of western Zimbabwe. These massacres, known as the Gukurahundi, lasted from 1983 to 1987, resulted in an estimated 2,000 to 30,000 deaths. The extent of Mnangagwa's role in the massacres is disputed, with Mnangagwa himself denying any involvement. He stated in a 2017 interview: "How do I become the enforcer of the Gukurahundi? We had the President, the Minister of Defence, the commander of the army, and I was none of that." Despite his denial, Mnangagwa is accused by many, including foreign governments, opposition politicians, and human rights groups, of playing a significant role in, if not orchestrating, the Gukurahundi. As Minister of State Security, his CIO worked with the army to suppress ZAPU, a rival political party that drew its support from Ndebele people. In the lead-up to the massacres, he delivered speeches attacking the opposition. In a 15 March 1983 speech at a rally in Victoria Falls, reported by The Chronicle, he described government opponents as "cockroaches" and "bugs" the problem had reached a level requiring the government to bring in DDT (a pesticide) to remove them. He also said that their villages should be burned. In another, he said: "Blessed are they who follow the path of government laws, for their days on earth shall be increased. But woe unto those who will choose the path of collaboration with dissidents, for we will certainly shorten their stay on earth." When the massacres began, Mnangagwa was tasked with explaining the violence to the international community, making most of the public comments on behalf of the Zimbabwean government on the activities of the 5th Brigade. In addition, documents from both the United States Department of State and the Australian Embassy in Harare reveal Mnangagwa's knowledge of and role in the Gukurahundi. While the 5th Brigade, rather than Mnangagwa's CIO, carried out the vast majority of the killings, the CIO participated in other ways, including apprehending and interrogating alleged dissidents. Whereas the 5th Brigade targeted large numbers of Ndebele civilians, the CIO often focused on more specific targets, particularly ZAPU leaders and organizers. The CIO also provided information, including documents and surveillance intelligence, to the 5th Brigade and other parts of government involved in the violence. The CIO gave Bush War-era ZIPRA personnel files to the 5th Brigade, which used them to seek out ex-ZANU and ZIPRA leaders in Matabeleland. In addition to focused violence and intelligence-sharing, CIO leaders also cooperated with other groups participating in the Gukurahundi through informal channels of communication. Stuart Doran, an independent historian, wrote that in Zimbabwe, coordination between government agencies did not always occur within bureaucratic channels, but often through tribal or political connections. Doran argued that as Mugabe's security minister, Mnangagwa's role was not restricted by the limitations of his ministry or the CIO. The Gukurahundi ended with the signing of the Unity Accord on 22 December 1987. The accord, signed by Prime Minister Mugabe and ZAPU leader Joshua Nkomo merged ZANU and ZAPU into the Zimbabwe African National Union – Patriotic Front, or ZANU–PF. On 18 April 1988, Mugabe announced amnesty for all dissidents, and in return, Nkomo called on them to lay down their arms. In the late 1980s, a serious of court cases exposed the existence of apartheid South African spies within the CIO, who played a significant role in causing the Gukurahundi by providing distorted intelligence reports and purposely inflaming ethnic tensions. These spies, white holdovers from the Rhodesian era, contributed to South Africa's interest in destabilizing Zimbabwe. In particular, they sought to damage ZAPU and ZIPRA, which maintained close ties to the African National Congress, the leading anti-apartheid group fighting the government in South Africa. Mnangagwa admitted that the South Africa had a "major implant in intelligence under Smith" and that "they initially left these implants." Asked why these agents were allows to remain the CIO, he responded "We had no choice. We could not allow our whole intelligence capability to collapse overnight." White CIO agents who cooperated with South Africa included Geoffrey Price, an agent responsible for Prime Minister Mugabe's personal security, who, along with a small cell of white agents, supplied information leading to South Africa's August 1981 assassination of Joe Nzingo Gqabi, an ANC representative in Zimbabwe. Another, Matt Calloway, formerly the CIO's top agent in Hwenge District, was in 1983 connected by the Zimbabwean government to a South African operation that recruited disaffected Ndebeles and sent them back into Matabeleland as trained and armed guerillas. The violence they sparked contributed to the start of the Gukurahundi. A third was Kevin Woods, an agent until 1986, who served as the CIO's top administrative officer in Bulawayo, the largest city in Matabeleland, throughout much of the Gukurahundi. In 1988, Woods was arrested and charged with participating in a car bomb attack targeting an ANC representative in Bulawayo. At his trial, in a confession given freely because, he said, he feared interrogation methods with he was very familiar from his time at the CIO, Woods admitted to being a double agent for South Africa. Woods' confession, in a high-profile case that reached Zimbabwe's Supreme Court, brought new attention to the wide scope of South Africa's infiltration of Zimbabwe's intelligence apparatus, especially in relation to the Gukurahundi. The Woods exposé was embarrassing for Mnangagwa, and according to one source, caused Mugabe to remove him from the position of Minister of State Security. In 1988, President Mugabe appointed Mnangagwa Minister of Justice, Legal and Parliamentary Affairs. According to a 1988 report by the American embassy in Harare, Mugabe originally intended to appoint Mnangagwa Minister of Defence, but was persuaded not to by Nathan Shamuyarira and Sydney Sekeramayi, the leaders of the "Group of 26", a clique that sought to increase the political power of members of the Zezuru people, a Shona subgroup. Shamuyarira and Sekeramayi objected to Mnangagwa's appointment to the post because he was Karanga, another Shona subgroup, but did not oppose Mugabe's replacement appointee, Enos Nkala, an Ndebele. Not coincidentally, Sekeramayi himself succeeded Mnangagwa as Minister of State for National Security. Instead, Mugabe appointed Mnangagwa Minister of Justice, succeeding Eddison Zvobgo, another Karanga. Mnangagwa, who expected to be named Minister of Defence or Minister of Home Affairs, considered this appointment a demotion, as the ministry, under Zvobgo, had already completed its most important tasks in recent years. These included drafting the constitutional amendments for abolished the 20 seats in Parliament reserved for whites, and establishing an executive presidency, which both were completed in 1987. Mnangagwa was initially so disappointed that he considered leaving politics and entering the private sector, but eventually accepted his new position. Mnangagwa ran for reelection to Parliament in the 1990 election, this time in the newly-created Kwekwe constituency. ZANU–PF ran a publicized and organized campaign in Kwekwe, holding meetings between Mnangagwa and community leaders, and putting up numerous posters. However, there were also reports of voter intimidation and harassment, including from Women's League members, some of whom said they were threatened into joining a demonstration against the Zimbabwe Unity Movement, the rival party contesting Mnangagwa's seat. On election day, Mnangagwa won with 23,898 votes, while his little-known rival, ZUM candidate Sylvester Chibanda, received only 7,094 votes. Mnangagwa was reelected again in the 1995 parliamentary election, in another race marked by voter intimidation. Election monitors in Kwekwe reported that voters were told that if they did not vote with ZANU–PF, the Gukurahundi atrocities would be repeated against them. Kinshasa, where Mnangagwa was often based during the Second Congo War. While justice minister, Mnangagwa also served as acting Minister of Finance from 1995 to 1996, after the previous minister, Bernard Chidzero, stepped down due to health reasons. He was also acting Minister of Foreign Affairs for a short period. In 1998, Mnangagwa was put in charge of Zimbabwe's intervention in the Second Congo War, in which the Zimbabwe National Army entered the Democratic Republic of the Congo to defend Congolese President Laurent-Désiré Kabila. A 2000 article in the Zimbabwean magazine Moto described him as Mugabe's heir apparent, and wrote "With the DRC issue at hand, it has been difficult to tell whether he is the Minister of Justice or the Minister of Defence as he has been shuttling between Harare and Kinshasa." During the war, Mnangagwa enriched himself through mineral wealth seized from the Congo. After Billy Rautenbach, a Zimbabwean businessman, was placed in charge of Gécamines, the Congolese state mining company, Mnangagwa began brokering deals between the company and Zimbabwean connections. Mnangagwa ran in the 2000 parliamentary election as the ZANU–PF candidate for the Kwekwe constituency. He was defeated by the Movement for Democratic Change candidate, Blessing Chebundo, who received 64% of the vote to Mnangagwa's 35%. Mnangagwa lost in spite of ZANU–PF's voter intimidation and violence, which included dousing Chebundo in petrol and attempting to burn him alive, as well as setting Chebundo's house on fire. After his defeat, Mugabe appointed Mnangagwa to one of the 20 unelected seats in Parliament. On 17 July 2000, Mugabe announced a new cabinet, from which Mnangagwa was conspicuously absent. His exclusion from the cabinet fanned speculation that he, widely seen as Mugabe's preferred successor, had lost favour with the President. However, the next day, the Members of Parliament were sworn in, and Mnangagwa was elected Speaker of the House of Assembly, receiving 87 votes against the MDC candidate Mike Mataure's 59 votes. The secret ballot election was the first competitive Speaker's election since the country's independence. Rather than having lost the President's favour, Mugabe likely excluded Mnangagwa from the cabinet because he was arranging for him to serve as Speaker instead. In October 2000, Mnangagwa thwarted an attempt by the MDC members of Parliament to impeach Mugabe. During his speakership, Mnangagwa continued to be subject to international scrutiny regarding his mining interests in the Congo during the Second Congo War. A 2001 United Nations report described him as "the architect of the commercial activities of ZANU–PF." A Guardian article from the same year wrote that Mnangagwa "negotiated the swapping of Zimbabwean soldiers' lives for mining contracts." In 2002, a report authored by a five-member panel commissioned by the UN Security Council implicated him in the exploitation of mineral wealth from the Congo and for his involvement in making Harare a significant illicit diamond trading centre. The panel and recommended that he, along with 53 others, be subject to international travel bans and financial restrictions. In December 2004, internal divisions within ZANU–PF became public when Mnangagwa, along with Jonathan Moyo, the Minister of Information, were censured at a party meeting for allegedly plotting against Mugabe. The controversy began when Moyo hosted a meeting with other politicians in his home district of Tsholotsho to discuss replacing Mugabe's choice for First Vice-President, Joice Mujuru, with Mnangagwa. As Vice-President, they hoped Mnangagwa would be in a superior position to become President when Mugabe stepped down, which they thought might happen as early as 2008. They also wished to replace ZANU–PF chair John Nkomo and party vice-president Joseph Msika with their preferred candidates. Despite President Mugabe's calls for unity, observers described the rivalry between supporters of Mnangagwa and Mujuru as the most serious division within ZANU–PF in 30 years. Mujuru garnered a large amount of support in ZANU–PF's politburo, central committee, presidium, and among the provincial party chairs. Mnangagwa's support came from the senior ranks of the security establishment, as well as parts of ZANU–PF's parliamentary caucus and younger party members. The rivalry was ethnic as well as political: Mnangagwa drew his support from members of his ethnic group, the Karanga, while Mujuru's supporters were largely Zezuru. At the party congress, held 1–5 December 2004, Mujuru was named Vice-President, and Moyo and other Mnangagwa proponents were disciplined. Moyo was removed from the cabinet and the Politburu, and seven others were penalized with suspensions, preventing them from running for Parliament in the upcoming elections. Mnangagwa attempted to distance himself from the controversy, but nevertheless lost his title as ZANU–PF's Secretary for Administration, an office he had held for four years and one that allowed him to appoint his allies to important party positions. In what was considered a demotion, was given the less influential position of Secretary for Legal Affairs instead. In the March 2005 parliamentary election, Mnangagwa was again defeated by Blessing Chebundo in the Kwekwe constituency, this time with 46% of the votes to Chebundo's 54%. Just as before, Mugabe appointed Mnangagwa to one of the unelected seats in Parliament. John Nkomo replaced Mnangagwa as Speaker of Parliament. In the new cabinet, Mugabe named Mnangagwa as Minister of Rural Housing and Social Amenities. This was widely seen as a demotion by Mugabe in retribution for Mnangagwa's involvement in the plot for him to become Vice-President over Mujuru, the President's choice. In 2005, Mnangagwa helped carry out Operation Murambatsvina, an initiative in which urban slums, home to large populations who opposed Mugabe, were destroyed, resulting in the homelessness of thousands of the urban poor. By 2007, Mnangagwa was reportedly back in Mugabe's favour, while the President was said to be dismayed at the activities of Mnangagwa's rival, Vice-President Mujuru, and her husband, former army chief Solomon Mujuru. In May 2007, the Zimbabwean government announced that it had foiled an alleged coup d'état involving nearly 400 soldiers and high-ranking members of the military that would have occurred on either 2 or 15 June 2007. The alleged leaders of the coup, all of whom were arrested, were retired army Captain Albert Matapo, Zimbabwe National Army spokesman Ben Ncube, Major General Engelbert Rugeje, and Air Vice Marshal Elson Moyo. According to the government, the soldiers planned on forcibly removing Mugabe from the presidency and asking Mnangagwa to form a government with the heads of the armed forces. Reportedly, the government first learned of the plot when a former army officer in Paris, France, who opposed the coup contacted police and gave them a map and list of those involved. Mnangagwa said that he had no knowledge of the plot, and called it "stupid." Some analysts speculated that rival potential successors to Mugabe, such as former ZANLA leader Solomon Mujuru, may have been behind the scheme in an attempt to discredit Mnangagwa, who had for a number of years been seen as the President's likely successor. Treason charges were laid against Matapo and other alleged plotters, but no trial ever took place for lack of evidence. Nevertheless, Matapo and six others (not including Ncube, Rugeje, or Moyo) ended up spending seven years in Chikurubi Prison before being released in 2014. Matapo denied that he and the other accused plotters planning a coup, and said he had no interest in supporting Mnangagwa, whom he regarded as equally bad, if not worse than Mugabe. Instead, Matapo said that the group were simply trying to form a new political party, which they eventually did after their release from prison. In the March 2008 parliamentary election, Mnangagwa stood as ZANU–PF's candidate in the newly-created Chirumanzu–Zibagwe constituency in rural Midlands Province. He won by a wide margin, receiving 9,645 votes against two MDC candidates, Mudavanhu Masendeke and Thomas Michael Dzingisai, who respectively received 1,548 and 894 votes. Mnangagwa was Mugabe's chief election agent during the 2008 presidential election, and headed Mugabe's campaign behind the scenes. Along with his team, Mnangagwa worked with party loyalists within the Joint Operations Command to ensure a Mugabe victory on election day. He organised a campaign of violence in the leadup to the second round of voting that caused opposition leader Morgan Tsvangirai, who had won the first round, to withdraw from the election, which secured Mugabe's continued rule. After the Movement for Democratic Change – Tsvangirai won a majority of seats in Parliament, Mnangagwa played a critical role in brokering a power-sharing pact between ZANU–PF and the MDC–T. When the Government of National Unity was sworn in on 13 February 2009, Mnangagwa became Minister of Defence. Despite having organised a campaign of political violence against the MDC–T in 2008, and allegedly having been behind three separate attempts to assassinate Tsvangirai over the years, Mnangagwa spoke kindly about the country's coalition government in a 2011 interview. He said, "a lot of things have happened that are positive... we can work together without too many problems." In spite of his compliments of the unity government, Mnangagwa was accused by human rights groups of using his influence in the Joint Operations Command to mobilize violent pro-ZANU–PF groups ahead of the 2013 elections. Mnangagwa denied that he was in charge of the JOC, calling the allegations "nonsense" and insisting that he wanted upcoming elections to be "free and fair." He also denied having any presidential ambitions, pointing out that ZANU–PF has procedures to choose a new president. In the July 2013 general election, Mugabe was reelected President by a wide margin, and ZANU–PF regained its majority in the House of Assembly. On 10 September 2013, Mugabe announced a new cabinet, appointing Mnangagwa to the post of Minister of Justice, Legal and Parliamentary Affairs, the office he previously held from 1989 to 2000. Vice-President Joice Mujuru's faction of the party was seen as the victor in Mugabe's cabinet appointment, taking most key positions, including Minister of Defence, which was previously Mnangagwa's office but was given to Sydney Sekeramayi in the new cabinet. In contrast, Mnangagwa's faction received only two key portfolios: Patrick Chinamasa as Minister of Finance, and Mnangagwa himself as Minister of Justice. Eldred Masunungure, a political scientist at the University of Zimbabwe, attributed the Mujuru faction's gains to their influence in the ZANU–PF presidium. Masunungure described Mnangagwa's move from being Minister of Defence to becoming Minister of Justice as a "significant blow, though the justice ministry is quite important." On 10 December 2014, President Mugabe appointed Mnangagwa as First Vice-President of Zimbabwe, appearing to confirm his position as the presumed successor to Mugabe. His appointment followed the dismissal of Mnangagwa's long-time rival in the succession, Joice Mujuru, who was cast into the political wilderness amidst allegations that she had plotted against Mugabe. Mnangagwa admitted he was not sure how the President would react to the allegations against Mujuru, but said he was satisfied with the outcome. He added that he had not known he was going to be named Vice-President until Mugabe announced it. Mnangagwa was sworn in as Vice-President on 12 December 2014, while retaining his post as Minister of Justice. Soon afterward it was reported that Mugabe had begun delegating some presidential duties to Mnangagwa. On 11 January 2016, Mnangagwa became acting President of Zimbabwe while President Mugabe was on his annual vacation. Mnangagwa took over from Second Vice-President Phelekezela Mphoko, who had been acting President since Mugabe went on vacation on 24 December 2015. The decision to have Mnangagwa serve as acting President rebutted rumors that Mugabe favoured Mphoko over Mnangagwa. 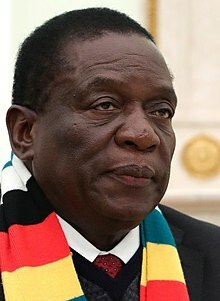 As Vice-President, Mnangagwa focused on reviving Zimbabwe's agricultural sector and expanding the country's global trade connections. He helped negotiate trade deals with BRICS members Russia, China, and South Africa. In 2015, he also headed trade delegations to Europe to try and re-open trade ties that had been broken with the imposition of sanctions in 2001. In July 2016, Mnangagwa visited China, where he met with business leaders as well as Communist Party leaders and government officials, including Vice President Li Yuanchao. An interview Mnangagwa did with China Central Television, in which he said that Zimbabwe had fallen behind in development and called for reform, reportedly angered Mugabe, who saw it as criticism of his presidency. In 2016, Mnangagwa announced that the Zimbabwean government would launch "Command Agriculture", an agricultural program backed by the African Development Bank. The program, which Mnangagwa said would receive US$500 million in funding, would involve 2,000 maize-growing small-scale and commercial farmers and would allow the government to determine how much maize is grown and the price at which it is sold. Until she was dismissed as First Vice-President, Joice Mujuru was widely seen as Mnangagwa's main rival to succeed Mugabe as President. However, with Mujuru and her key supporters having been purged from the government and the party, she was no longer a threat to Mnangagwa. Prior to her dismissal, Mujuru had been the target of relentless disparagement by the President's wife Grace Mugabe, who accused her of corruption and incompetence. Because both found common cause in opposing Mujuru, by the time he became Vice-President, the First Lady was seen as an emergent political ally of Mnangagwa. However, by late 2015, Mnangagwa's political ambitions openly clashed with those of Grace Mugabe, who by then was seen as a potential successor to her husband. ZANU–PF was largely split between two factions, the Generation 40 (or G40), led by the First Lady, and the Lacoste faction, thought to be led by Mnangagwa. Mnangagwa drew his support from war veterans and the country's military establishment, in part because of his past leadership of the Joint Operations Command, as well as his reputation in Zimbabwe as a cultivator of stability. The First Lady, a relative political newcomer and head of the ZANU–PF Women's League, drew her support from younger, reform-minded party members who sought to replace the old guard. As her G40 faction set their sights on Mnangagwa, the Lacoste faction, largely made up of senior party members, pushed back. Mnangagwa used his leadership of Zimbabwe's Anti-Corruption Commission to try to discredit G40 leaders by targeting them with highly publicized criminal investigations. By 2016, Grace Mugabe was openly savaging Mnangagwa at political rallies and speaking events. Speaking to crowds at a February 2016 ZANU–PF rally in Chiweshe, she accused him of disloyalty and infidelity, among other offences. She accused him of feigning love for the President, and mocked his presidential ambitions, rhetorically asking, "Didn't you hear there's no vacancy at State House?" (the presidential residence). The First Lady further accused Mnangagwa, or his supporters, of trying to bomb her dairy farm (in fact, several army officers and fringe political activists were charged with the crime), and insinuated that his supporters were behind a plot to murder her son. Later that year, in November 2016, Mugabe declared that she was "already President" at a Women's League assembly, adding, "I plan and do everything with the President, what more do I want?" Still, President Mugabe did not, at least publicly, take sides in the feud between his wife and the Vice-President. In February 2017, after his 93rd birthday, Mugabe announced he would not retire nor pick a successor, though he said he would let ZANU–PF pick a successor if it saw fit. In July 2017, Grace Mugabe publicly called on her husband to name an heir. Mnangagwa said that doctors had confirmed that he had been poisoned during an August 2017 political rally led by the president and had to be airlifted to a hospital in South Africa for treatment. He also pledged his loyalty to the ZANU–PF party and President Mugabe and said that the story spread by his supporters that Grace Mugabe had ordered the poisoning via a dairy farm she controlled was untrue. Grace Mugabe denied the poisoning claims as ridiculous and rhetorically asked: "Who is Mnangagwa, who is he?" Phelekezela Mphoko, Zimbabwe's other Vice-President, publicly criticised Mnangagwa, saying that his comments about the August incident were part of an attempt to weaken the country, the power of the president, and divide ZANU–PF, claiming that doctors had concluded that stale food was to blame. In October 2017, Mnangagwa lost his position as minister of justice to Happyton Bonyongwe, the country's spymaster, though he maintained the vice-presidency. Mnangagwa was removed from his post as Vice President on 6 November 2017 by Mugabe after allegedly plotting against the government and displaying "traits of disloyalty, disrespect, deceitfulness and unreliability", according to Information Minister Simon Khaya Moyo. His removal made it more likely that President Robert Mugabe's wife Grace would follow in her husband's footsteps as leader of Zimbabwe. She had earlier called on her husband to remove the Vice-President. Mnangagwa subsequently fled to South Africa citing "incessant threats" against him and his family. On 19 November 2017, Mnangagwa became the leader of ZANU-PF and was reported as likely to soon become President of Zimbabwe after the military and public action against Mugabe. Robert Mugabe was given a deadline of resignation by noon of 20 November before the impeachment process would begin. However, he still refused to step down, despite his political controversy. Before impeachment could begin the next day, Mugabe resigned from office. In accordance with the Zimbabwean constitution, the vice president, Phelekezela Mphoko, became acting president, pending nomination of a new candidate by the ruling party. The ZANU-PF chief whip duly nominated Mnangagwa, telling news organisations that he would take over as president within 48 hours. Mnangagwa returned to Zimbabwe on 22 November 2017, following a temporary stay in South Africa. Zimbabwean State Broadcaster, ZBC, confirmed that Mnangagwa would be sworn in as President of Zimbabwe on 24 November 2017. The day before his inauguration, Mnangagwa urged his followers not to seek "vengeful retribution" against his political enemies after calls from his supporters to attack the Generation 40 faction. Mnangagwa celebrating following his swearing-in at the National Sports Stadium. On 24 November 2017, Mnangagwa was sworn in as Zimbabwe's new president in Harare's National Sports Stadium, before a crowd of about sixty thousand. Entertainment was provided by singer Jah Prayzah, and attendees included foreign dignitaries including several African leaders, as well as opposition leaders Morgan Tsvangirai and Joice Mujuru. Among the attendees were then President Ian Khama of Botswana, former Namibian President Hifikepunye Pohamba and founding President Sam Nujoma as well as current Vice President Nickey Iyambo, Presidents Filipe Nyusi of Mozambique and Edgar Lungu of Zambia, as well as former Zambian President Kenneth Kaunda, and Rory Stewart, Britain's Minister of State for Africa and the first British minister to visit Zimbabwe in two decades, who issued a statement describing the change in leaders as "an absolutely critical moment" after Mugabe's "ruinous rule". Notable absentees included Mugabe, as well as then President Jacob Zuma of South Africa, who was represented by his telecommunications minister, Siyabonga Cwele. Mnangagwa was sworn in by Chief Justice Luke Malaba. During his first speech, he vowed to serve all citizens, revitalize the struggling economy, and reduce corruption. He also paid tribute to Robert Mugabe, who did not attend the inauguration for alleged health reasons, as his mentor. Mnangagwa also distanced himself from his predecessor by promising to "re-engage with the world." He also said that Mugabe's post-2000 land reform programmes would be maintained, although white farmers would be compensated for their seized land. He also said that the 2018 general election would go ahead as planned. He also called for an end to EU and US sanctions against top military and ZANU-PF figures (he is himself still under US sanctions for his role under Mugabe). On 18 January 2018, Mnangagwa signalled his desire to re-engage with the West by inviting the United Nations, European Union and the Commonwealth to monitor elections in Zimbabwe in 2018. Additionally, Mnangagwa has signalled his wish to re-establish good relations with the United Kingdom and additionally rejoin the Commonwealth, a prospect which he said was improved by the British exit from the European Union. On 27 November 2017, Mnangagwa dissolved the Cabinet of Zimbabwe and appointed only two acting ministers. Misheck Sibanda, Chief Secretary to the President and Cabinet, issued a statement saying "[t]o allow for uninterrupted services in critical ministries of government, the following have been appointed ministers in acting capacity until the announcement of a new cabinet: Honourable Patrick Chinamasa as acting minister of finance and economic development, and Honourable Simbarashe Mumbengegwi as acting minister of foreign affairs." His new cabinet was named on 30 November 2017. On 3 December 2017, Mnangagwa was met with criticism over his new cabinet appointments which led to him replacing two of his cabinet ministers. On 6 December 2017, Mnangagwa was criticised because members of the armed forces and police services drove vendors from the streets of Harare and took the goods which they were attempting to sell. Some of the vendors were heard saying Mnangagwa was worse than Robert Mugabe and that "Mugabe was in a way better, he never sent soldiers to take away our goods." Whilst leaving the podium after addressing a rally at White City Stadium in Bulawayo, the country's second largest city, and ahead of the scheduled July 31 elections, a grenade was thrown at Mnangagwa and exploded. Mnangagwa escaped unharmed, although several members of the ZANU-PF party were injured, including his first and second Vice-Presidents—Constantino Chiwenga and Kembo Mohadi—as well as Marry Chiwenga, the first vice-president's wife. In January 2019, nationwide protests broke out after Mnangagwa's government announced a 150% rise in the price of fuel. The police and military responded with a crackdown that resulted in hundreds of arrests and multiple deaths. Mnangagwa stated that claims of misconduct by the security forces would be investigated. Mnangagwa has, since the early 1990s, played a key role in implementing the "Indigenization and Black Economic Empowerment" initiative, as advised by prominent indigenous businessmen including Ben Mucheche, John Mapondera and Paul Tangi Mhova Mkondo and the think tank and lobby group IBDC, how to propel the policy from Local policy, Ministerial Policy, Government Policy & Development of a ministry specific to Indigenization & Black Economic Empowerment, such as Indigenization and Economic Empowerment Bill. Mnangagwa believes that the national resources should be protected by the Zimbabwe Defence Forces. Mnangagwa has been married three times and fathered nine children. His first wife was the sister of Josiah Tongogara, a fellow ZANLA commander, and died from cancer in 2000. Auxillia Mnangagwa is his third wife and was born in rural Zimbabwe, and has been involved in ZANU-PF politics since 1982. However, she only became a public figure in 2014 after she was elected in the constituency seat that her husband vacated to become Vice President that year. His eldest child, Farai Mlotshwa, is a property developer and is married to the lawyer of Mnangagwa's political rival Phelekezela Mphoko, a backer of the pro-Grace Mugabe Generation 40 faction. His youngest son is a DJ in Harare known as St Emmo. His youngest daughter Tariro volunteered to join a group of young female rangers dedicated to fighting poaching in the Zambezi valley and she is also acting in an anti-poaching awareness film titled Gonarezhou: The Movie set to be in cinemas in 2019. One of his twin sons serves in the presidential guard. Mnangagwa is considered to be one of the richest men in Zimbabwe. [not in citation given] He is a supporter of Chelsea F.C., because Ivorian footballer Didier Drogba played there. He is a member of the Methodist church. ^ Freytas-Tamura, Kimiko de (16 November 2017). "A Strongman Nicknamed 'Crocodile' Is Poised to Replace Mugabe". New York Times. Retrieved 19 November 2017. ^ a b Bearak, Max (22 November 2017). "Who is Emmerson Mnangagwa, Mugabe's successor in Zimbabwe?". Washington Post. Retrieved 1 December 2017. ^ Dale, D., ed. (1981). Duramazwi: A Basic Shona-English Dictionary. Gweru, Zimbabwe: Mambo. pp. 66, 154. ^ James Griffiths. "A 'tyrant' who could be Zimbabwe's next president". CNN. Retrieved 17 November 2017. ^ a b c Diseko, Lebo (24 November 2017). "Emmerson Mnangagwa: Will he be different from Mugabe?". BBC News. Retrieved 25 November 2017. ^ a b c d e f g h i de Freytas-Tamura, Kimiko (16 November 2017). "A Strongman Nicknamed 'Crocodile' Is Poised to Replace Mugabe". The New York Times. ISSN 0362-4331. Retrieved 17 November 2017. ^ a b c d e f g h i "The 'crocodile' who snapped back". BBC News. 15 November 2017. Retrieved 17 November 2017. ^ a b c d e f g h i j k l m n o p q r s t u v w x y z aa ab ac ad ae af ag ah ai aj ak al am an ao ap aq ar as at au av aw ax ay az "President Mnangangwa's early days, political career". The Sunday News. 26 November 2017. Retrieved 9 July 2018. ^ a b c d e f g h "Who Is Emmerson Mnangagwa?". VOA News. 14 November 2017. Retrieved 25 November 2017. ^ a b c d e f g h i Blair, David (10 December 2014). "Man they called 'the Crocodile' is Robert Mugabe's favoured successor". The Daily Telegraph. ISSN 0307-1235. Retrieved 25 November 2017. ^ a b c Kwaramba, Fungi (30 December 2015). "Mnangagwa's age, history continue to mystify". Nehanda Radio. Retrieved 9 July 2018. ^ a b c Manyukwe, Clemence (11 December 2014). "Profile: Emmerson Mnangagwa". The Chronicle. Retrieved 9 July 2018. ^ a b c d e f g h i j k l m n "Family". E.D.Mnangagwa. 16 November 2017. Retrieved 9 July 2018. ^ a b c d e f g h i j k l m n o "President-designate ED's timeline". The Herald. 24 November 2017. Retrieved 9 July 2018. ^ a b c d Marima, Tendai (24 November 2017). "Who is Emmerson Mnangagwa, Zimbabwe's 'Crocodile'?". Al Jazeera News. Retrieved 25 November 2017. ^ Martin, Meredith (2002). Our Votes, Our Guns: Robert Mugabe and the Tragedy of Zimbabwe. New York: Public Affairs. p. 23. ISBN 978-1-58648-186-5. ^ a b c d e f g h i j k l m n o Fletcher, Martin (1 January 2017). "The last days of Robert Mugabe". New Statesman. Retrieved 25 November 2017. ^ a b c d e f "Education". E.D.Mnangagwa. 16 November 2017. Retrieved 9 July 2018. ^ a b c d "Mnangagwa: Zimbabwe's President-in-waiting". NewsDay Zimbabwe. 22 November 2017. Retrieved 11 July 2018. ^ Chung, Fay (2013). "Chapter 5. Emergence of a New Political Movement". In Chan, Stephen; Primorac, Ranka (eds.). Zimbabwe since the Unity Government. London: Routledge. p. 63. ISBN 978-0-415-62484-8. ^ Dodman, Benjamin (22 November 2017). "Emmerson Mnangagwa, the disgraced Mugabe loyalist who took his revenge". France 24. Retrieved 25 November 2017. ^ a b c d e f g h i j k l m n o "US embassy's assessment of Mnangagwa in 1988". The Insider. 12 April 2012. Retrieved 18 October 2018. ^ a b Wessels, Hannes (2015). A Handful of Hard Men: The SAS and the Battle for Rhodesia. Casemate. pp. 23–24. ISBN 9781612003467. ^ a b c Wood, J. R. T. (2015). So Far and No Further! : Rhodesia's Bid for Independence During the Retreat from Empire 1959-1965. Trafford Publishing. p. 792. ISBN 9781466934078. ^ Binda, Alexandre (2008). The Saints: The Rhodesian Light Infantry. Johannesburg: 30° South Publishers. p. 38. ISBN 978-1-920143-07-7. ^ a b c d e f g h i j k l m n o p Zindoga, Tichaona; Mhaka, Gibson (27 January 2018). "Cell 42: The prison that couldn't stop ED's destiny". The Herald. Retrieved 11 July 2018. ^ St. John, Lauren (2007). Rainbow's End: A Memoir of Childhood, War, and an African Farm (First ed.). New York City: Scribner. p. 1. ISBN 978-0-7432-8679-4. ^ a b c d e f g h i j k l m Huni, Munyaradzi; Manzvanzvike, Tendai (3 April 2016). "Chimurenga II Chronicles: Torture, death & love in prison". The Sunday Mail. Retrieved 11 July 2018. ^ Conroy, John (2000). Unspeakable Acts, Ordinary People: The Dynamics of Torture. New York: Knopf. p. 176. ISBN 978-0-679-41918-1. ^ Thornycroft, Peta (6 November 2017). "Robert Mugabe fires vice president as Zimbabwe's succession battle intensifies". The Telegraph. ISSN 0307-1235. Retrieved 25 November 2017. ^ a b c d Nyarota, Geoffrey (2006). Against the Grain: Memoirs of a Zimbabwean Newsman. Zebra. pp. 107–108, 117. ISBN 9781770071124. ^ Ross, Jay (12 March 1980). "Mugabe Appoints Cabinet Designed To Placate Whites". The Washington Post. Retrieved 16 October 2018. ^ a b Bearak, Max (22 November 2017). "Analysis | Who is Emmerson Mnangagwa, Mugabe's successor in Zimbabwe?". Washington Post. ISSN 0190-8286. Retrieved 25 November 2017. ^ "Zimbabwe's Army Chief Is Dismissed for Disloyalty" (PDF). The New York Times. 17 September 2018. Retrieved 16 October 2018. ^ a b c d e "Emmerson Mnangagwa: the man behind the coup". Financial Mail. 22 November 2017. Archived from the original on 1 December 2017. Retrieved 25 November 2017. ^ Catholic Commission for Justice and Peace in Zimbabwe, ed. (1997). Breaking the Silence, Building True Peace: Report on the 1980s Disturbances in Matabeleland and the Midlands. Harare, Zimbabwe: Catholic Commission for Justice and Peace in Zimbabwe and the Legal Resources Foundation (Zimbabwe). OCLC 40480429. Archived from the original on 1 November 2013. Retrieved 20 November 2017. ^ Hill, Geoff (2005) . The Battle for Zimbabwe: The Final Countdown. Johannesburg: Struik Publishers. p. 77. ISBN 978-1-86872-652-3. ^ a b c "US cables link Mnangagwa, Mugabe to Gukurahundi". Bulawayo24 News. 31 December 2017. Retrieved 16 April 2018. ^ a b Allison, Simon (24 November 2017). "Gukurahundi ghosts haunt Mnangagwa". Mail & Guardian. Retrieved 16 April 2018. ^ a b c d e f g h i j Doran, Stuart (27 November 2017). "Op-Ed: Mnangagwa and the Gukurahundi – fact and fiction". Daily Maverick. Retrieved 17 October 2018. ^ Ndlangisa, Sabelo (23 November 2017). "Zim expats remember Mnangagwa's role in Gukurahundi massacres". TimesLIVE. Retrieved 16 April 2017. ^ Ndlangisa, Sabelo (23 November 2017). "Mnangagwa's role in Gukurahundi massacres not forgotten for Zim expats". SowetanLIVE. Retrieved 16 April 2017. ^ Samukange, Tinotenda (18 May 2015). "Mugabe's Gukurahundi role exposed". NewsDay Zimbabwe. Retrieved 17 October 2018. ^ a b "Mnangagwa announces new Cabinet". Zimbabwe Mail. 30 November 2017. Retrieved 1 December 2017. ^ a b c "Landmarks in Robert Mugabe's life". The Independent. 24 June 2008. Retrieved 17 October 2018. ^ a b c d e f g h i j k Berkeley, Bill (22 October 1989). "Apartheid's Spies". The Washington Post. Retrieved 18 October 2018. ^ a b c Masendeke, Anthony F.; Mhlaba, Luke; Mafico, Muriel U. (1991). Report on the 1990 general and presidential elections. University of Zimbabwe, Dept. of Political and Administrative Studies. ^ Kriger, Norma (January 2005). "ZANU(PF) Strategies in General Elections, 1980-2000: Discourse and Coercion". African Affairs. 104 (414): 1–34. doi:10.1093/afraf/adi016. JSTOR 3518631. ^ Country Reports on Human Rights Practices. Washington, D.C.: U.S. Government Printing Office. 1996. p. 306. ISBN 9780160524806. ^ a b Moto. Mambo Press. 2000. ^ Blair, David (18 January 2001). "Kabila is gone but diamonds are forever". The Telegraph. ISSN 0307-1235. Retrieved 23 October 2018. ^ a b c d e f g Tafirenyika, Mugove (26 May 2015). "'Mnangagwa cannot win elections'". DailyNews Live. Retrieved 24 October 2018. ^ a b c d e Chinaka, Chris (20 July 2000). "Zimbabwe Elects New Speaker". The Moscow Times. Retrieved 23 October 2018. ^ a b c d e Winter, Joseph (30 March 2007). "Profile: Emmerson Mnangagwa". BBC News. Retrieved 23 October 2018. ^ a b Lebo Nkatazo, "After 2 defeats, Mnangagwa opts for rural constituency" Archived 8 February 2008 at the Wayback Machine, Newzimbabwe.com, 5 February 2008. ^ "Zimbabwe: parliamentary elections Parliament, 2000". archive.ipu.org. Retrieved 23 October 2018. ^ Blair, David (2002). Degrees in Violence: Robert Mugabe and the Struggle for Power in Zimbabwe. London and New York: Continuum. p. 196. ISBN 978-0-8264-5974-9. ^ Norman, Andrew (2008). Mugabe: Teacher, Revolutionary, Tyrant. Stroud: The History Press. p. 86. ISBN 978-1-86227-491-4. ^ McGreal, Chris (29 May 2001). "An army guarding power and profits". The Guardian. Retrieved 23 October 2018. ^ a b "U.N. Study Says Armies Leave Corrupt Networks in Congo". The New York Times. 22 October 2002. Retrieved 22 October 2018. ^ a b c d e "Final nail in Moyo coffin". Daily Mirror. 29 December 2004. Retrieved 23 October 2018. ^ a b c d e f "Mugabe ministers in court battle". BBC News. 20 January 2005. Retrieved 23 October 2018. ^ a b c "Zimbabwe: Waiting for the Future" (PDF). Africa Briefing No. 103. International Crisis Group. 29 September 2014. Archived from the original (PDF) on 30 September 2014. Retrieved 9 October 2014. ^ a b "Mugabe promotes hard liner". News24. 12 April 2005. Retrieved 23 October 2018. ^ a b c d e Mortimer, Caroline (21 November 2017). "Emmerson Mnangagwa: After Robert Mugabe resigns, who is the Zanu-PF politician favourite to succeed him as Zimbabwe President?". The Independent. Retrieved 25 November 2017. ^ a b Staff Reporter (22 November 2017). "Mnangagwa: Zimbabwe's President-in-waiting". Newsday Zimbabwe. Zimbabwe Situation. Retrieved 26 November 2017. In the March 2005 parliamentary election, he was again defeated by Chebundo in Kwekwe and Mugabe again appointed him a non-constituency MP. He was demoted to a lesser influential post of Rural Housing and Social Amenities minister in 2005 following the elevation of Joice Mujuru to the post of Vice-President. ^ a b "MP's sworn in, new ministers appointed", SADOCC, 16 April 2005. ^ "Zimbabwe: Alleged coup plotters deny treason charges". Irish Examiner. 16 June 2007. Retrieved 24 November 2017. ^ "Zimbabwe election results 2008". New Zimbabwe. 1 April 2008. Archived from the original on 5 April 2008. ^ a b "Mnangagwa Running Zanu PF Campaign", Zimbabwe Independent, 8 May 2008. ^ Dzirutwe, MacDonald (13 February 2009). "Zimbabwe's MDC says senior official arrested". Reuters. Archived from the original on 14 February 2009. ^ Berger, Sebastien; Thornycroft, Peta (13 February 2009). "Zimbabwe minister arrested as cabinet sworn in". The Telegraph. ISSN 0307-1235. Retrieved 24 October 2018. ^ a b c d e Freeman, Colin (19 June 2011). "Emmerson Mnangagwa vs Morgan Tsvangirai: the two opposing faces of Zimbabwe". The Telegraph. ISSN 0307-1235. Retrieved 24 October 2018. ^ "Breaking news:President Mugabe Appoints New Cabinet". The Herald. Harare, Zimbabwe. 10 September 2013. Archived from the original on 12 September 2013. ^ a b c d e Munyaka, Takudzwa (13 September 2013). "Zim VP Mujuru's ring takes Cabinet". The Mail & Guardian. Retrieved 24 October 2018. ^ a b MacDonald Dzirutwe, "Zimbabwe's Mugabe names 'The Crocodile' Mnangagwa as deputy", Reuters, 10 December 2014. ^ a b Mbiba, Lloyd (23 February 2015). "Mnangagwa fingers Grace". DailyNews Live. Retrieved 27 October 2018. ^ "Zimbabwe's Mnangagwa sworn into office, leads race to succeed Mugabe". Reuters. 12 December 2014. Archived from the original on 26 April 2015. ^ "President unveils new ministers". The Herald. Harare, Zimbabwe. 12 December 2014. Archived from the original on 26 April 2015. ^ "The year of leaving dangerously", Africa Confidential, volume 56, number 1, 9 January 2015. ^ a b c "Latest: VP Mnangagwa now Acting President". The Herald. 11 January 2016. Retrieved 26 October 2018. ^ a b Mambo, Elias (24 March 2016). "Mnangagwa's China trip angers Mugabe". The Zimbabwe Independent. Retrieved 26 October 2018. ^ a b Gambara, Peter (21 August 2016). "Demystifying Command Agriculture". The Sunday Mail. Retrieved 26 October 2018. ^ "Breaking News: VP Mujuru bites the dust". The Herald. Harare, Zimbabwe. 9 December 2014. Archived from the original on 26 April 2015. ^ a b Cowell, Alan (10 December 2014). "Zimbabwe Leader Picks Hard-Liner as Vice President". The New York Times. Retrieved 27 October 2018. ^ Maponga. George (9 April 2015). "Zimbabwe: No Split in Zanu-PF, Says Mnangagwa". The Herald. Harare, Zimbabwe. Archived from the original on 26 April 2015. ^ "Mujuru putschists vindicate expulsion". The Herald. Harare, Zimbabwe. 7 April 2015. Archived from the original on 26 April 2015. ^ "Emmerson Mnangagwa Sworn In As Zimbabwe's Vice-President". NDTV. 12 December 2014. Retrieved 26 October 2018. ^ a b "VP sets CIO on rivals". The Zimbabwean. 30 September 2015. Retrieved 29 October 2018. ^ a b c Burke, Jason (6 November 2017). "Robert Mugabe sacks vice-president to clear path to power for wife". The Guardian. ISSN 0261-3077. Retrieved 25 November 2017. ^ Gaffey, Conor (24 August 2017). "Can Robert Mugabe's wife, Grace, still be president of Zimbabwe?". Newsweek. Retrieved 15 November 2017. ^ a b c "Mnangagwa called Grace a prostitute?". The Zimbabwean. 14 February 2016. Retrieved 23 December 2018. ^ a b c Tafirenyika, Mugove (13 February 2016). "Grace mauls Mnangagwa". DailyNews Live. Retrieved 23 December 2018. ^ "I'm already president, Grace Mugabe claims – report". News24. 22 November 2016. Retrieved 23 December 2018. ^ Dzirutwe, MacDonald (10 October 2017). "Zimbabwe's Mugabe creates cyber ministry in cabinet reshuffle". Reuters Africa. Retrieved 25 November 2017. ^ Moyo, Jeffrey (6 November 2017). "Mugabe Fires Vice President, Clearing Path to Power for Wife". The New York Times. ISSN 0362-4331. Retrieved 7 November 2017. ^ "Zimbabwe's Robert Mugabe fires vice president Emmerson Mnangagwa", Sky News, UK, 6 November 2017. Retrieved on 7 November 2017. ^ "Zimbabwe's Ousted Vice President Flees After Death Threats", Bloomberg News, USA, 8 November 2017. Retrieved on 8 November 2017. ^ "Robert Mugabe set to hand over power to ex-VP Emmerson Mnangagwa 'imminently' – report - TODAY.NG". 16 November 2017. Retrieved 19 November 2017. ^ "As it happened: Mugabe resigns". ^ News, ABC. "Zimbabwe's incoming leader returns home to cheers". ^ "'New democracy unfolding' in Zimbabwe". 22 November 2017 – via www.bbc.co.uk. ^ "Zimbabwe's Mnangagwa sworn in as president". RTÉ. 24 November 2017. Retrieved 25 November 2017. ^ a b c McKenzie, David; McKirdy, Euan; Dewan, Angela (24 November 2017). "Zimbabwe's 'Crocodile' Emmerson Mnangagwa sworn in as leader". CNN. Retrieved 25 November 2017. ^ a b c "Zimbabwe's new president Mnangagwa vows to 're-engage' with world". BBC News. 24 November 2017. Retrieved 25 November 2017. ^ a b c "Zimbabwe's Mnangagwa takes power and vows to serve all citizens". BBC News. 24 November 2017. Retrieved 25 November 2017. ^ Tendai Marima (24 November 2017). "Emmerson Mnangagwa sworn in as Zimbabwe president". Al Jazeera. Retrieved 26 November 2017. The swearing-in ceremony was attended by a number of regional dignitaries and international diplomats, including Botswana's President Ian Khama, who received a huge welcome following his repeated calls in recent days to Mugabe to step down. Mozambican President Filipe Nyusi and his Zambian counterpart Edgar Lungu, as well as Zambia's former President Kenneth Kaunda were also in attendance. Also present was Rory Stewart, Africa minister for Britain, Zimbabwe's former colonial power. ... Before the ceremony, Stewart, the first British minister to visit Zimbabwe in two decades, described in a statement the change in leadership as "an absolutely critical moment" after Mugabe's "ruinous rule. ^ a b Joseph Cotterill; David Pilling (24 November 2017). "Mnangagwa sworn in as Zimbabwe's president". Financial Times. Retrieved 26 November 2017. The former president, who had ruled the country since independence from Britain in 1980, did not attend the ceremony. ... But a notable absence was South Africa's President Jacob Zuma, who sent his telecommunications minister to represent Zimbabwe's most important neighbour. ^ "Minister Cwele to represent South Africa at President Mnangagwa inauguration". La Gazzetta del Sudafrica. 24 November 2017. Archived from the original on 24 November 2017. Retrieved 26 November 2017. ^ Burke, Jason (24 November 2017). "Emmerson Mnangagwa promises 'free and fair' elections in Zimbabwe". The Guardian. ISSN 0261-3077. Retrieved 25 November 2017. ^ Roland Oliphant; Peta Thornycroft (24 November 2017). "President Emmerson Mnangagwa promises to pay compensation for land grabs and clean up Zimbabwe's 'poisoned politics' as he is sworn in". Telegraph. Retrieved 26 November 2017. he ... called on the international community to lift sanctions in recognition of the country's "new start." ... and called for the EU and the United States to drop sanctions against top military and ZANU PF figures. ^ "Zimbabwe's new leader Mnangagwa still under US sanctions". News24. 23 November 2017. Retrieved 26 November 2017. Zimbabwe's incoming leader remains under United States sanctions for his activities as Robert Mugabe's deputy and enforcer. ^ a b "Zimbabwe's president seeks to build bridges with west". Retrieved 19 January 2018. ^ "Mnangagwa dissolves cabinet, Chinamasa appointed Acting Finance Minister - The Zimbabwe Mail". 27 November 2017. ^ "Zimbabwe's new president appoints interim cabinet - IOL News". ^ "Zimbabwe leader criticised over Cabinet appointments". Daily Nation. Retrieved 4 December 2017. ^ "Zimbabwean vendors pushed from streets as army, police start raids | IOL News". Retrieved 6 December 2017. ^ "Zimbabwe President Mnangagwa says he was 'inches' from Bulawayo explosion". BBC News. 23 June 2018. ^ "Mnangagwa back in Zimbabwe, vows to probe protest crackdown". Al Jazeera News. 22 January 2019. ^ "IBDC hails President". The Sunday Mail. 11 August 2013. Archived from the original on 14 December 2013. ^ Mahr, Krista (24 November 2017). "Auxillia Mnangagwa: Zimbabwe's little-known new first lady with big shoes to fill". The Telegraph. ISSN 0307-1235. Retrieved 25 November 2017. ^ Mashaya, Blessings (18 April 2016). "Mnangagwa's daughter weds Mphoko's lawyer". Daily News. Retrieved 25 November 2017. ^ "Zimbabwe – Mnangagwa's daughter joins anti-poaching unit". Africa Sustainable Conservation News. 20 December 2017. Retrieved 28 March 2019. ^ comments, Blessing Masakadza • 2 October 2018 1:59PM • 0. "ED's daughter in anti-poaching film". DailyNews Live. Retrieved 28 March 2019. ^ "Mugabe successor is Chelsea fan dubbed 'Crocodile' who led massacre of 20,000". The Sun. 16 November 2017. Retrieved 25 November 2017.